After marinating the beef, I caramelized 2 yellow onions and 4 cloves of garlic. I wanted to extract the sugars and condense them. This is a sweet dish using only the natural sugars that exists in the onions, garlic and tomatoes. Burner was set to medium. Remember my sun dried tomatoes? I chopped up about 3/4 cup of them and tossed in. Use a can of tomato paste otherwise. I then added a pint of our canned tomatoes and Basil. Transfer onions, tomatoes etc to a small mixing bowl and transfer about 25% of the drained beef into the Dutch oven and turn the heat to high. Transfer browned beef to another mixing bowl and repeat ’til all the beef has been seared. Turn the heat down to medium and add the reserved Chianti to deglaze the Dutch oven. Scrape all the great flavors from the bottom and sides. The beef was salt and peppered when I marinated it so the only seasoning to add now will be the herbs. I used a tablespoon of our Italian mix. Place Dutch Oven in a 325 degree oven for 2 1/2 hours, check tenderness, remove when beef is tender. Different cuts take different times. 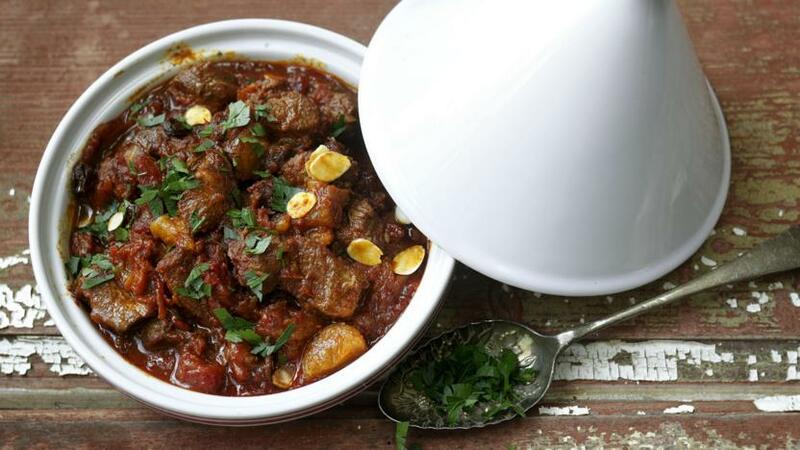 This is one of those dishes that you prefer a stew cut because the longer the cook, the better the melding of flavors. Ready to serve? If you made our tomato and spinach pasta, this would be an excellent time to use it. The added flavors of the pasta along side the Chianti and tomato beef go great together. Of course a second bottle of Chianti would also go well with this dish. This is more Greek than Italian,. Maybe if Odysseus had been lured by the wonderful smell of this stew he would not have had himself bound to the mast but would have succumbed to the Sirens. He may have never returned to Penelope. I am a fan of good stew beef but sometimes a bargain comes along and you have to make do :-). I lucked out and found on sale Choice Sirloin Petite steaks for $2.99 a pound. Of course you need to expect the hidden fat but that just adds to the flavor. Assemble your tools, good cutting block, beef, a good slicer and of course a bottle of Chianti. Medium price works great. If you are thirsty, have a beer instead. Cut steaks into 1 inch cubes trimming excess fat at the same time. After cutting, weigh the remaining beef. I had 4 pounds 10 ounces so I separated out 2 pounds and froze for a good Astoria Stew. I like to weight the trash so I know what to expect in the future. I also like to weight the meat being used as it will help me determine the amount of seasoning and herbs used. Trash pickup was 3 hours ago, bag the garbage to keep the rodents away. After all there will be 7 days to attract them. Now I use a gallon zip lock bag to marinate the stew in. Pour in the entire 750 ml bottle of Chianti or any other red blend you like, add 1/2 teaspoon each of salt and pepper. Double bag and refrigerate for several hours. I prefer overnight. Most of the time a recipe will call for 1/2 to 1 cup of red wine. We use an entire 750 ml bottle here. 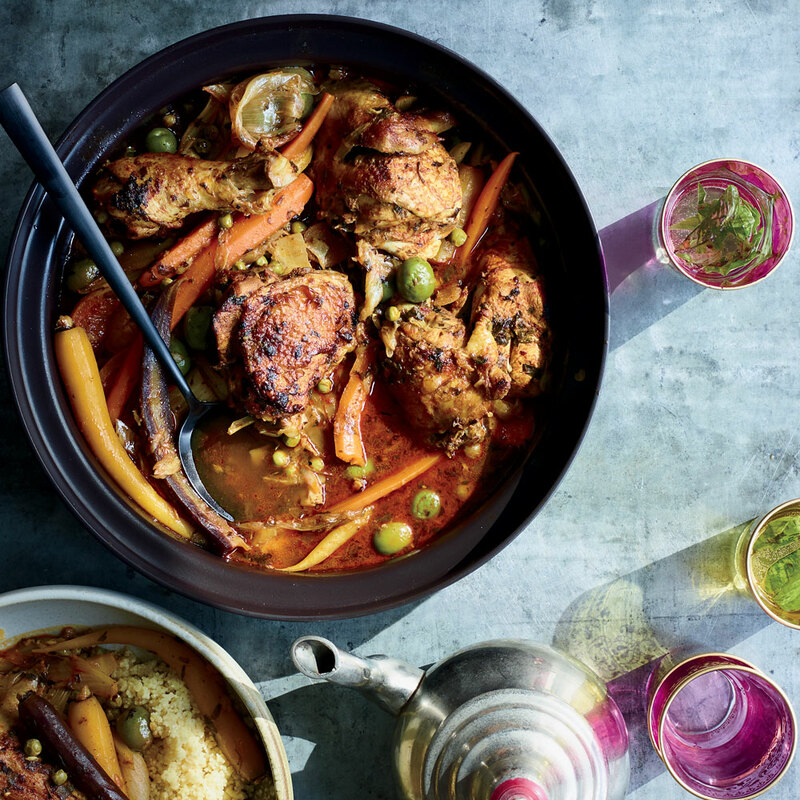 Think of this as a Red Wine Stew instead of a Stew with Red Wine. There isn’t any comparison between the two. I would have still used the whole bottle if this was a normal 2lbs of beef stew. Please go to Part 2 for the actual assembly of the stew. Francene and I were picking up a few items at our local market and there was a package of Cranberry-Orange Scones on the marked down table. They looked great and we hadn’t eaten so they looked even better. A summit conference was held in the aisle and we decided that nice bowl of soup when we got home would be a better choice, and then we could make our own scones. Now the problem with making your own baked goods is that there is only the 2 of us, Molly, the Jack Russell doesn’t count here. We found a few good recipes, and the one that sounded the best was from Ina Garten, the Barefoot Contessa. We especially liked the comments section where one Einstein said the recipe makes too many scones (16), so make the recipe, shape, mold and otherwise prepare everything for baking, then freeze most of them to be baked at a later date. Duh, why couldn’t I have thought of that. Ina Garten’s recipe is here. When I bake I always rely on a recipe. To me, cooking is an art form and baking is a science. This means there is less room for error and substitutions, so I generally get everything out and measured before I start. It is better to stop and go to the store before the mixing begins. Scones have a heavy yet flaky texture, and this is due more to the way the butter is added and mixed then most anything else. The butter needs to be chilled and cubed, then mixed at slow speed until the butter has partially blended. There should be pea sized chunks in the dry mixture. When you add the wet mixture, do so on the quicker side and mix at the lowest speed until just blended. Do not over mix or you will end up with biscuits instead of scones. In addition to Ina’s recipe I increased the cranberry’s another 1/2 cup and added 1/2 cup coarse chopped pecans. I didn’t have a nice 3 inch cutter so I shaped three 7 inch circles and one 8 inch circle, then divided them into 4ths. I then did an egg wash with the orange juice added and sprinkled some raw sugar on top so the glaze would occur during baking. Before baking, I wrapped three of the rounds and put in the freezer, we sure didn’t need 16 scones beckoning to us at one time. After baking at 400 degree for probably 22 minutes, the round was removed from the oven and left to cool, the 4 sections then pulled apart. The rest of the rounds will be separated before baking as the first method left the center of the round or the end of each scone 3/4 baked. Not raw dough, but not evenly baked either. The final verdict: Easier to buy at the store, but taste better when you do them yourself. They where great with the first cup of coffee. Okay, to the point. Every child hates having to eat those over boiled, mushy Brussels sprouts. They are tasteless and just not at all appealing. Golly, this sounds like a lot of vegetables our parents cooked for us. Francene hates boiled Brussels sprouts, I have a close friend that hates boiled asparagus, put these foods on serving plates and the skip right over them. Francene’s son told her that he loved Brussels sprouts, but not boiled, roasted. Roasted till some of the leaves actually turned black. So she tried sauteing them with, cut in half, a little EVO. salt and pepper. It’s one of her favorite vegetables now. That friend and asparagus, bbq asparagus that is, loves those skinny little stalks now. A little EVO, salt and pepper, then placed on a hot grill right after the steaks have been removed. Cook until dark grill marks appear and the asparagus spears are a delight to eat. What made these often avoided vegetables not only acceptable but enjoyed was that they weren’t boiled to mush then served. Roasting, grilling and sauteing gives us control of how long to cook, and visually we are making our decision to remove them from the heat based on caramelization, the oxidation of sugar resulting in a nutty flavor and brown color. The internet is a great place to look up roasted Brussels sprouts and asparagus, as there are so many slight variations, adding garlic, different spices and herbs. I haven’t seen a recipe that didn’t look good to me as well as adding a little variety. I would also suggest that you cook them al dente. I know I don’t care for mushy vegetables. Brussels sprouts can be frozen and if bought on the stalk you will have the freshest Brussels sprouts available year round. It is simple to do, cut off the stalk with as little stem as possible, remove and the soft leaves and then blanch the spouts in boiling water for 3 to 4 minutes, remove and give them an ice water bath. Spread out on cookie sheets and freeze, then package into serving sizes. Vacuum sealed if possible. Oh, those soft leaves, throw in the boiling water and cook for a few minutes. They are a great treat and way to get your dog eating their vegetables. The stuff you learn along the way, so simple now, why didn’t I think of it before. We aren’t health nuts but we do like to hedge our bets a bit. For years I have made spinach pasta and sun dried tomato pasta, messy and wet pasta, pasta that wasn’t very good because of that spinach and because of those tomatoes. See, I would make my basic pasta then throw in a handful of fresh spinach, the water in the spinach would then mess up the flour consistency and I would have to start adding flour till I had that nice ball of raw pasta dough. For the sun dried version, I would throw in a handful of sun dried tomatoes in oil, and then start adding flour till it looked like pasta dough. Doing this would always mess up the basic flour, egg, oil and water ratios. and I ended up with a boiled flour mixture that looked like pasta. It needs to be noted that 3 pounds of fresh greens produced 1 and 1/2 cups of dried, crumbled greens. 1 cup of flour and 1/2 cup of greens, in the blender and now I have power greens flour. From this point, I just made pasta dough. Put all in a food processor and start processing, add water by the tablespoon till you get a dough that sticks together, but isn’t sticky. Put coarse dough on your work surface and kneed about 6 to 7 minutes, This helps with consistency and the ability to hold its’ shape by stretching and working the gluten in the flour. Form a ball of dough, wrap in plastic wrap and refrigerate. For the tomato pasta dough, just repeat the above steps.